Like many people, I’ve been fascinated by the story of Huguette Clark, the 104-year-old multimillionaire who died in 2011 after having spent much of her life in anonymous seclusion. Ever since Bill Dedman’s investigative reports began surfacing in 2010, I’ve enjoying reading about the copper heiress who was born in Paris in 1906 and lived most of her long, luxurious life in New York City before meeting what I would call a tragic end -- with a relatively healthy body and mind, Huguette spent the last twenty-two years of her life in a hospital room instead of one of her three palatial homes. In Empty Mansions: The Mysterious Life of Huguette Clark and the Spending of a Great American Fortune, Dedman and co-writer Paul Clark Newell, Jr., Huguette’s second cousin, have written the definitive account of her eccentric life. As the last child born to 67-year-old copper king and (briefly) Senator William A. Clark and his 28-year-old wife, Anna LaChapelle, Huguette was perhaps bound from the beginning to be odd. The death of her older, teenaged sister, with whom she was close, surely didn’t help. Nor did the immense amounts of money and attention. Still, hers was a charmed life, full of travel and music and lengthy correspondence with friends. It wasn’t until 1991, when a doctor made a house call to her Fifth Avenue apartment and discovered a skeletal woman with various cancers, that it seemed her life was coming to its natural close. But, in many ways, that was just the beginning of this strange tale, because the patient recovered, and yet ended up staying in the hospital for the next 7,364 nights. And she began giving away her money -- by the millions -- which didn’t go unnoticed by long-lost relatives or, once Dedman was on the trail, the media. This is a story that very much needed to be told. 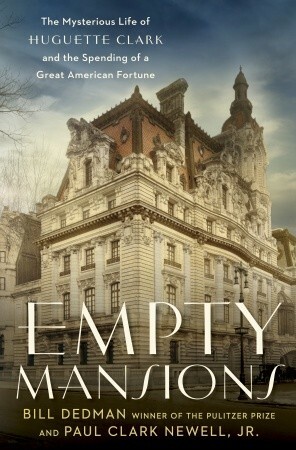 Empty Mansions is full of rich details and solid research--we’d expect nothing less of the Pulitzer Prize-winning Dedman--and yet I did not come away as convinced as the authors seem to be about Huguette’s decision-making skills as she aged, or indeed that her mental capabilities had ever progressed past childhood. It’s difficult and sad to imagine that a person of reasonable adult faculties would choose to remain hidden away in a small, sterile room watching The Smurfs on television when she could have had the world at her fingertips, or that she didn’t feel trapped by those around her--nurses, hospital administrators, lawyers, accountants--who claimed to be (or truly thought they were) helping. The book’s publication this week coincides with a trial set to begin tomorrow that pits nineteen of Clark’s (mostly estranged) relatives against the beneficiaries of her last will (a charitable foundation, a hospital, a nurse, a goddaughter, an attorney, an accountant, and several employees). The relatives believe that Huguette was mentally incompetent when the last will was signed and that she may have been the victim of fraud. It’s an incredible tale, and not yet complete. Like many people, I've been fascinated by the story of Huguette Clark, the 104-year-old multimillionaire who died in 2011 after having spent much of her life in anonymous seclusion. Ever since Bill Dedman's investigative reports began surfacing in 2010, I've enjoying reading about the copper heiress who was born in Paris in 1906 and lived most of her long, luxurious life in New York City before meeting what I would call a tragic end -- with a relatively healthy body and mind, Huguette spent the last twenty-two years of her life in a hospital room instead of one of her three palatial homes. In Empty Mansions: The Mysterious Life of Huguette Clark and the Spending of a Great American Fortune, Dedman and co-writer Paul Clark Newell, Jr., Huguette's second cousin, have written the definitive account of her eccentric life. As the last child born to 67-year-old copper king and (briefly) Senator William A. Clark and his 28-year-old wife, Anna LaChapelle, Huguette was perhaps bound from the beginning to be odd. The death of her older, teenaged sister, with whom she was close, surely didn't help. Nor did the immense amounts of money and attention. Still, hers was a charmed life, full of travel and music and lengthy correspondence with friends. It wasn't until 1991, when a doctor made a house call to her Fifth Avenue apartment and discovered a skeletal woman with various cancers, that it seemed her life was coming to its natural close. But, in many ways, that was just the beginning of this strange tale, because the patient recovered, and yet ended up staying in the hospital for the next 7,364 nights. And she began giving away her money -- by the millions -- which didn't go unnoticed by long-lost relatives or, once Dedman was on the trail, the media. This is a story that very much needed to be told. Empty Mansions is full of rich details and solid research--we'd expect nothing less of the Pulitzer Prize-winning Dedman--and yet I did not come away as convinced as the authors seem to be about Huguette's decision-making skills as she aged, or indeed that her mental capabilities had ever progressed past childhood. It's difficult and sad to imagine that a person of reasonable adult faculties would choose to remain hidden away in a small, sterile room watching The Smurfs on television when she could have had the world at her fingertips, or that she didn't feel trapped by those around her--nurses, hospital administrators, lawyers, accountants--who claimed to be (or truly thought they were) helping. The book's publication this week coincides with a trial set to begin tomorrow that pits nineteen of Clark's (mostly estranged) relatives against the beneficiaries of her last will (a charitable foundation, a hospital, a nurse, a goddaughter, an attorney, an accountant, and several employees). The relatives believe that Huguette was mentally incompetent when the last will was signed and that she may have been the victim of fraud. It's an incredible tale, and not yet complete.